I’ve never been able to understand it. 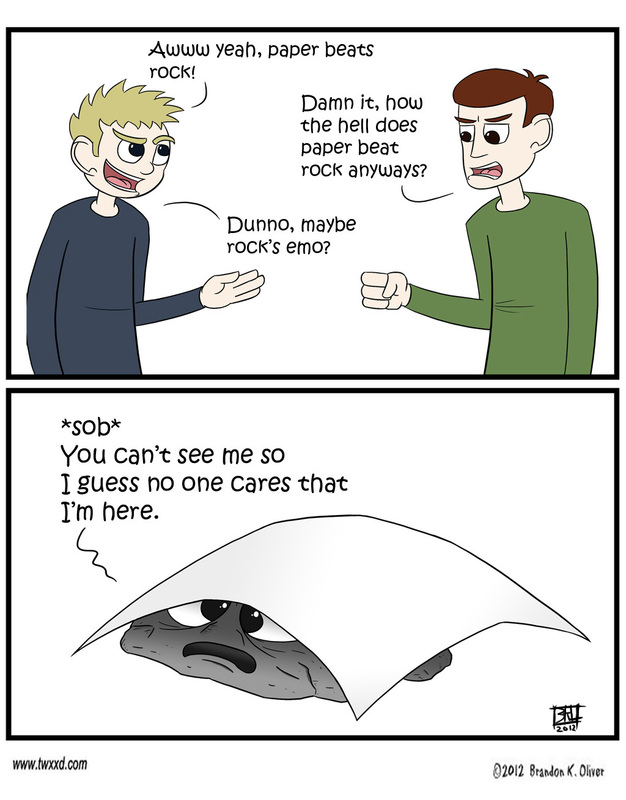 Why the hell does paper beat rock? I mean, I get it, for the purposes of the game…yada yada, but man does it ever sound dumb when you really think about it. I mean, the kind of rock that gets defeated by paper isn’t gonna be smashing any scissors either, right? Very true and very wierd. Awwww! Isn’t that the cutest rock ever? Yes he is! Cutie pants! It’s like Battle Beast. How the hell does wood beat water? Water can freaking destroy wood. But those are the rules of the game. Until you just freaking punch the paper throwing in the face with your rock punch. True. At the very least wood floats on water though…paper just kind of sits over top of rock and it submits. I have thrown rocks at paper, I have no idea how paper wins; it NEVER won. At least you didn’t mention Lizard or Spock, it gets even more confusing then. Lol, oh god, Sheldon’s version doesn’t count. Paper covers rock in shame. The rock is shaped like a dong and hiding it’s shame? Maybe there is some embarrassing revelation about the rock on the paper… in a sense, the rock would be defeating… himself. Emo rock is so sad… He needs to hook up with scissors, show paper what’s up. It might be a hard match-up. I’ve heard scissors is kind of metal. Stop being brilliant. You’re making everyone else look bad. I take that as the highest compliment coming from the genius of the Obscure Gentlemen! Paper beating rock never made much sense to me either. I’ve used rocks to straight terrorize sheets of paper before. But in the game, no such luck.